Bringing up a child is as delicate and important task as planting a seed and lovingly nurturing it till it becomes a plant and a tree. As parents most of the time we interact with them as teachers and instructors, which most of the times becomes unavoidable. Even most of the times in our own hearts we feel if there is some other delicate or smooth way to make him learn and understand. Let us discuss those ways. 1. To our eyes children may seem small and their feelings and emotions may seem small but if we think about it from their point of view and their mindset. We will be able to understand them and respect their feelings. So, when children are upset, instead of shouting or yelling at them you have to be with them hear them, allow them to speak out their heart and then guide them and correct them when they are calm and ready t listen. 2. Children are our reflection they learn things from us by seeing us and imitating us. Our behavior is what they see try to imitate, we are their role models. So, before blaming children for any sort of behavior we should check ourselves as to how we are behaving in front of them. So, want to correct the child, we need to correct ourselves first. 3. Until and unless there is established relationship and bonding between the parents and the child, children will not readily accept or learn everything we teach them. So, if you want them to listen to you and walk the path you wish them to, first strengthen your relationship with them, and give them more attention and love. Then tell them how to do and what to do. 4. As parents if we want our children to listen to our words and do as we say (for their own benefit) first we should make them understand the fact that we care about their feelings and we do understand them. And this is possible only through our behavior with them and in the way we interact with them. 5. 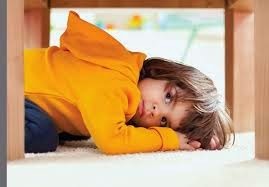 Many times children really can’t express their inner feelings if they are feeling upset, frustrated or disappointed and so they choose away and act in a way that is disturbing and irritating. In such cases instead of seeing superficial behavior we should make an attempt to bring out their feeling and allow them to express what they are feeling. 6. Spare some time for your child everyday at least half an hour a day and be all with him by body mind and heart. Play with him as he does talk to him or just tell him some stories, do anything but stay connected. 7. Children feel close and loved when they are touched physically. So give them a kiss and a hug if not more at least once a day in the morning when they wake up or at night before going to bed. Or whenever you feel they need some understanding or they feel lonely or down.